Wow, this week has really flown by! I can't believe we're starting a new week already. I didn't accomplish too much this week. I just took it easy and finished unpacking, cleaning out things, incorporating all my jewelry making paraphonalia into one area of the house (oh, for a bigger house with more storage!). I just stocked the fridge today so no hurricanes please! Last time I did that Wilma came along and I lost everything I had just bought after getting back from NY! I finished a couple of orders and mailed them off. I'm working on a couple of more. I'm trying to get myself ready for craft fairs but I haven't registered for any yet. How do you find them? I've searched the internet but how do you find the small church bazzars and pre-Christmas craft fairs and flea markets? That's the biggest problem! 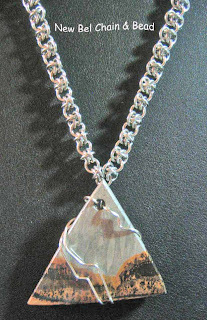 The necklace above, is made with a very unusual stone that I found in a Rock & Gem Club show in Freeport, NY. It's called a view stone. It's Japanese and you can see some kind of view in each stone. 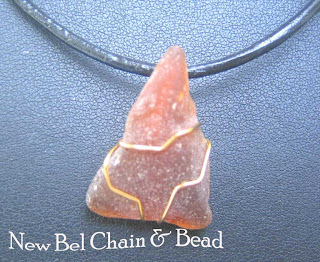 This one is triangular and looks to me like the mountains in the west. Beautiful isn't it? Better in person! The chain is made with bright aluminum rings and is very light weight. The chainmaille weave is called the Barrel Weave. I'm selling it but I love looking at it and will find it difficult to part with! It started on Friday when my granddaughter passed her divers test. She has this little red sports car waiting for her and she didn't disappoint it. She passed the first time! She's happy now that she has some freedom. My daughter and her husband went away for the weekend and I stayed with the two granddaughters. They are old enough to be no problem and great company most of the time! The first day we went to play glow-in-the-dark mini-golf at the mall. Interesting but fun. Then out to dinner at Out-Back Steakhouse. Yesterday we all went to see "A Comedy of Errors" at the Orlando Shakespeare Festival. Even the 9 y/o enjoyed it! They did a great job and presented it as very funny. I'm home now and looking forward to a week of rest and jewelry making. I have some orders that I have to catch up on. I also have to mail my passport application. The cruise will come up quicker than I think! The above picture shows a piece of Long Island sea glass, picked from a beach in the Hamptons, wrapped with bronze wire and hung from a leather cord. I just had to post one of my granddaughter's art work! Isn't it beautiful? She's so very talented! I'm back! The NY summer was very successful. I renewed old friendships and even made a few new ones! I went to a great block party in my old neighborhood and saw some people that I hadn't seen in years. It was a blast! I learned some new jewelry making techniques thanks to Cher at Studio 59 in Lake Ronkonkoma. Pictured here is one project done under her guidance. The trip home went pretty smoothly and I got to spend a week with my daughter and grandson in South Carolina. He's getting so big and so smart! He's three and knows how to click and drag and drop on the computer!